Craig Altobello - Marquetry Exhibit - Goosebay Sawmill and Lumber, Inc.
Craig Altobello has been coming into our shop for some time now. I’ve been lucky enough to have seen some of his work. It isn’t often that you see someone do what he does. 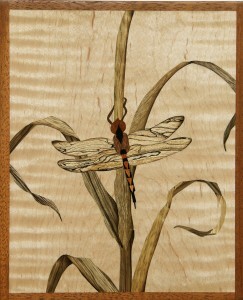 His work is being shown in an exhibit at the Conservation Center in Concord, NH. Here is a write up that they did on Craig. “Even the floorboards aren’t safe from wood artist Craig Altobello’s appraising eye. 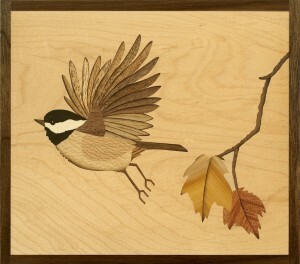 When he needed to tear up a few white oak boards during a home improvement project, he didn’t see scraps, he saw the right color and grain for creating a leafy branch in one of his works of art using the ancient but little-known craft of marquetry. The result can be seen in the image of a woodcock that is part of Altobello’s exhibit hanging at the Conservation Center headquarters of the Society for the Protection of N.H. Forests until the end of April. The exhibit features nature-inspired works made mostly from native New Hampshire hardwoods like hickory, apple, aspen, maple and black locust. Altobello, of Peterborough, was a hobby woodworker for decades before getting inspired by marquetry, a wood inlay technique of piecing together thin wood cutouts — only one-sixteenth of an inch thick – into beautiful, multi-shaded images. Each piece of wood’s patterning and color inspires what it might become once a thin slice of it is fitted into a scene, Altobello said. “A two-by-four is more than a stud – it’s a sky,” he said about one of his creations. A former science teacher, Altobello said he uses close observations of the natural world, especially the birds, plants, trees and landscapes of New Hampshire, to provide the subject matter of his works. His teaching background also comes through in his enthusiasm for sharing marquetry with others, and his exhibit includes panels explaining the technique step-by-step.